Our Deathrattle Hunter deck list guide features the best Rise of Shadows deck list for Season 61 of Hearthstone (April 2019). Our Deathrattle Hunter guide also contains Mulligan advice, card combos and strategy tips. Deathrattle Hunter is a Hearthstone deck that utilises a number of Deathrattle cards from both the Boomsday and historical card sets in order to create a tremendously sticky board presence that the opponent should struggle to hold back. 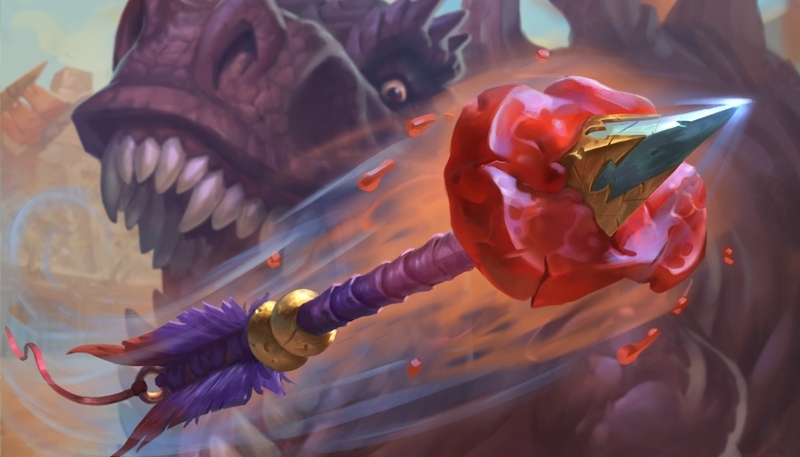 In the seventh edition of our guide to playing this deck, we've highlighted a deck list that's now been optimised for the Rastakhan's Rumble meta. We've also got an extremely detailed strategy section that will help you out with every match-up. Additionally, you'll find Mulligan advice, as well as a breakdown of all the combos in this deck. You'll find our current Deathrattle Hunter deck list further down the page, but we wanted to drop in a version of the archetype ready for the expansion launch. The rest of this guide will be updated once we have a refined version of this archetype. For now, everything below this point refers to the previous version of the article, but contains some useful info nevertheless. This is the version of Deathrattle Hunter that's the strongest in play right now. We'll keep updating our recommended list for as long as the deck is part of the Hearthstone meta. Deathrattle Hunter does exactly what its name would suggest: it uses Deathrattle minions and their synergies with Hunter class cards to take full advantage of their effects so you can build up a board that overwhelms your opponent. It works because there are many ways for you to trigger Deathrattle effects early - or more than once - in this deck. The deck has been a formidable threat since it rose to prominence during the Boomsday meta, and now a couple of new cards from the Rastakhan set have only developed it further. They haven’t fundamentally changed how the deck plays, but they have given it some more late game power and another big way to exploit all the Deathrattle cards on offer. Early game: You can use Tracking to find some of the Deathrattle minions you want to establish on the board nice and early on, while Prince Keleseth provides as much value as always. Beyond this mighty card, Devilsaur Egg is another core card to play and you can activate it with Play Dead or Terrorscale Stalker. Meanwhile, Candleshot can help you keep any early pressure from your opponent in check. Mid game: Now, more significant Deathrattle cards start to come into play. Obviously, there’s Carnivorous Cube, which can lead to many Deathrattle cards getting way out of hand. Terrorscale Stalker can be used to perform a faster version of that same function, while Zilliax and Witchwood Grizzly provide defensive options. Late game: If you’ve managed to exploit enough of your Deathrattle minions, the game should be looking well in your control by this stage. To finish the game off for good, though, you have Deathstalker Rexxar. The Build-A-Beast hero power will give you a lot more reach in the late game if you’re starting to run out of resources. You also have characters like Kathrena Winterwisp who can directly bring some of your big Beasts like King Krush or Charged Devilsaur into play. VIDEO GUIDE - Although the precise deck list being used will vary over time, we highly recommend watching the following Deathrattle Hunter video produced by Gaara. Even if the list changes, the principles won't and you'll learn a huge amount by watching the whole thing. 1. Candleshot is great at chipping away at your opponent’s small minions, and keeping their side of the board clear in the early stages. 2. Witchwood Grizzly is excellent at frustrating aggro players with its massive amount of Health. 3. Don’t try to be too greedy with the many Deathrattle plays you have here, as they may take too long to set up and give your opponent the chance to finish you first. 4. You have a couple of strong catch-up mechanics in the late game with the Battlecry effect of Deathstalker Rexxar and rush minion Zilliax. 1. Without the need to rush you can take time to set up especially strong plays with your Deathrattle minions to create large boards that are difficult to cleanly remove. 2. If you don’t win in the mid game there’s a reasonable chance you’ll need Deathstalker Rexxar to give you some extra reach in the late game, thanks to the Build-A-Beast hero power. 3. Spider Bomb is a brilliant removal option that can be combined with Play Dead for a cheap execution. 4. Although all your Deathrattle effects mean minions tend to stick on the board in some way - even after removal - be careful you don’t commit too many resources at once and starve yourself in the event of a total wipe. Here are a few cards you’ll want to go hunting for in your opening hand. 1. Prince Keleseth: The earlier you can play this immensely powerful card, the more benefit you'll gain from it as you draw through your deck. 2. Devilsaur Egg: Will happily sit on the board until you find a way to trigger the Deathrattle effect for a big swing play. 3. Candleshot: Can kill or finish off a lot of early game minions, while keeping your life total safe from damage. 4. Terrorscale Stalker: Excellent activator for your Deathrattle minions at any stage of the game. - You take no damage while swinging with Candleshot, so don't be afraid to chip away at a bigger minion over a couple of turns. - Play Dead is a crucial card in this deck, allowing you to trigger the Deathrattle of a friendly minion. Think particularly of cards like Devilsaur Egg and your post-absorption Carnivorous Cube in this context. - When Spider Bomb is destroyed it'll choose an enemy minion at random and obliterate it at the same time. - After playing Prince Keleseth, all of the minions you subsequently draw into will have an extra +1 / +1 of stats. It goes without saying that playing this card as early as possible in the match is crucial. - Another card that can be used to trigger crucial Deathrattles is Terrorscale Stalker. - Flanking Strike can very often be used to deal with an early to mid-game minion and leave yourself with a little extra board presence to play around with. - Witchwood Grizzly loses a point of potential Health for each card your opponent is holding at the time the card is played. - As long as Houndmaster Shaw is out in play, your minions possess the Rush keyword. That means they can attack enemy minions immediately, but they can't do any damage to the other player until the next turn. - Carnivorous Cube is an extremely powerful card in this deck. When you target a minion it'll be destroyed, but the Cube will gain a Deathrattle effect that summons two copies of that targeted minion. - When Kathrena Winterwisp is played onto the board she'll summon either Charged Devilsaur, Witchwood Grizzly, or King Krush (assuming they're still in your deck somewhere). She'll repeat this summoning effect when she dies as well. - Once Deathstalker Rexxar has been played you'll do two points of damage to all enemy minions. You also gain a new Hero Power which allows you to blend together the stats, effects and Mana cost of dead Beasts into new, monstrous creations! Here are some of the key cards seeing play in Deathrattle Hunter right now, as well as a few card swap options where possible. Play Dead: A super cheap way to activate the Deathrattle effects on your cards. Prince Keleseth: The earlier you play this the better as it will give a + 1 / + 1 buff to every minion still remaining in your deck. If you don’t own him you can put a Scarab Egg or two in his place. Devilsaur Egg: A summoned 5/5 Devilsaur on Turn 4 is tough for an opponent to deal with comfortably. More than one is very tough. Spider Bomb: Very cheap hard removal that’s much less awkward to activate thanks to all the triggers in this deck. Terrorscale Stalker: Another way for you to trigger Deathrattle minions while also adding a decent body to the board. Houndmaster Shaw: Giving Rush to the minions you spawn through Deathrattle effects makes them even more immediately impactful. Carnivorous Cube: Can create a lengthy chain of Deathrattle minions to pump out some ridiculous value - especially when paired with Devilsaur Egg or Mechanical Whelp. Zilliax: A strong Mech that can give you some protection and healing if the game goes late. Deathstalker Rexxar: Another card that excels in longer games. The Battlecry effect can help you catch up if behind against aggro, whereas the Build-A-Beast hero power can give you more resources if you’re running low. Swamp King Dred: Will chomp through all the small minions your opponent plays as they enter the battlefield making this a good anti-aggro option. You can run Amani War Bear in its place instead as it’s not a vital part of the deck. Da Undatakah: Synergises brilliantly with all the Deathrattle cards in this deck to give you one huge Deathrattle minion in the late game. Kathrena Winterwisp: With all the expensive Beast minions you run in the deck this can be a good way to get them onto the board for very little mana. King Krush: A big ol’ Beast that can serve as surprise burst damage or a way to clear away other minions in a pinch. Oondasta: Similar to Kathrena Winterwisp, Oodasta is able to bring out another of the deck’s costly Beast minions onto the board, making the value prospect very enticing. Apologies for the late update here. By all accounts it looks as though people are abandoning Hunter's Mark altogether in order to retain Prince Keleseth. I'll keep an eye on the deck over the next week or so though, and make another change if I think it's necessary. For now I've updated the deck list and also the combo advice to account for HM being lost. @Soxaldinho Yeah too bad Keleseth is not working anymore. Also I don't think we can easily drop Hunter's Marks here. I signed out Keleseth for an extra big beast. This is a nice deck for real. I am using a Mossy Horror to get rid of some aggro decks and annoying clone priest (with Zerek's gallery). Swapped Umbra and the Amani bear with Stitched Trackers, should make sense. I have traded out a tracking for Spiritsinger Umbra! As long as you don't hold onto devilsaur eggs or spider bots just to make SSU "worth it" and play as normal (play your 3 drops on curve), it'll reward you more than it hinders you. If you do drop it in turn 4, it's basically A 3/4 with taunt. At higher levels, people will likely know what's coming next so will be forced to destroy it (similar to Houndmaster Shaw). And tbh, tracking is useful, but I only ever use it late on anyway and certaibly don't miss having the second one. @Xentro Doh! It's the Corpse Widows. Two mins I'll add them in. I would like to make this deck. Sadly it only has 28 cards in it if I counted correctly. Can some one tell me what is missing?